Dr Ghazala Begum is a Postdoctoral Research Fellow working under the supervision of Professor Ann Logan and Lt Col Richard Blanch. Her role is to identify novel therapies of ocular disease and identifying methods to assess the delivery of these treatments to the back of the eye. 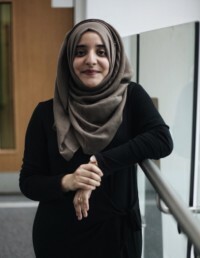 Ghazala successfully completed her PhD in Neuroendocrinology from the University of Manchester in 2014 which focused on investigating the epigenetic and transcriptional regulation of the energy regulating pathway in the hypothalamus. She then pursued a postdoc in Dr Daniel Fulton’s lab at the University of Birmingham identifying novel transcriptional targets of excitotoxicity in oligodendrocytes. Overall her research has contributed to several highly cited publications and well received oral presentations at national and international conferences.